Very shortly after the Houston Chronicle reported that Dickey was leaving, Yahoo’s Pat Forde and Adrian Wojnarowski reported that former Oklahoma and Indiana head coach Kelvin Sampson was a top candidate for the job. Sampson took the Sooners to the Final Four in 2004 and appeared to be building toward similar success at Indiana, but instead in 2008 earned both programs NCAA sanctions and himself a five-year show cause order based on a large number of impermissible calls to recruits. Sampson, now an assistant with the Houston Rockets, has been a candidate for several NBA head coaching jobs as well. Williams, earlier mentioned as a candidate at USF, instead accepted the head coaching job at Virginia Tech in a move that had AAC links of its own. Whit Babcock, Virginia’s Tech new athletic director, had left Cincinnati for the job, and admitted on Monday that current Bearcats coach Mick Cronin played match-maker between his old AD and his friend Williams. It was also reported on Monday that Cronin’s crosstown rival, Xavier coach Chris Mack, was a top candidate for the open Wake Forest job, where he was once an assistant for the late Skip Prosser. Williams and Mack both have a variety of reasons for (allegedly, in Mack’s case) wanting to leave the Big East. It has been reported that among Williams’ reasons for departing Marquette for a clearly lesser job in Blacksburg was displeasure over the Big East’s TV deal on little-watched FS1 compared with the ACC’s deal with all-powerful ESPN. The AAC also signed a deal with ESPN (and the less powerful CBS Sports Net), which appears to have been a wise business decision because it offers broader exposure for the basketball product. The old Big East split in two over football, specifically that the Catholic Seven’s concern that basketball had taken a back seat in the view of the conference. And yet it’s now the Big East that is losing coaches (although reports that Shaka Smart may replace Williams at Marquette would certainly quell some of those concerns), while the AAC could boast an impressive lineup of coaches next year. There’s Hall of Famer Larry Brown, who has resurrected the SMU program; Kevin Ollie, who has UConn in the Sweet Sixteen in just his second season; Cronin, coming off four straight NCAA trips, and Josh Pastner, coming off three; and Danny Manning, whose Tulsa team arrives in the league next year after winning the Conference USA title. 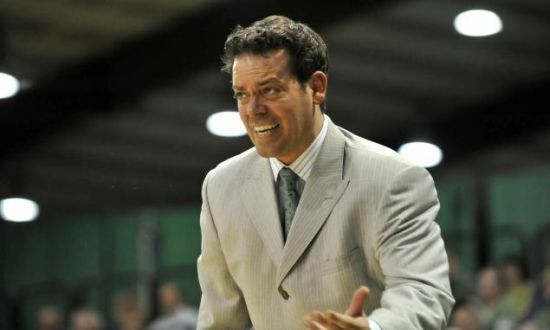 Adding Sampson, who has been to a Final Four, and Masiello, who rebuilt the Manhattan program, would leave the conference looking pretty strong as it shifts into its post-Louisville phase of development. This entry was posted on Tuesday, March 25th, 2014 at 12:21 pm by CD Bradley	and is filed under aac, coaching carousel, microsites. Tagged: buzz williams, chris mack, espn, houston, james dickey, kelvin sampson, marquette, rick pitino, stan heath, steve masiello, usf, wake forest, xavier. You can follow any responses to this entry through the RSS 2.0 feed. You can leave a response, or trackback from your own site.